Not only a PowerPoint to AVI converter, ImTOO Convert PowerPoint to AVI also provides you with all the necessary tools to help you personalize your PPT to AVI video output: rehearse, then record you own commentary; add background music; adjust conversion parameters; or remove all the animations and effects from the original PPT file. ImTOO Convert PowerPoint to AVI can save you precise time by converting multiple PPTs to AVI videos in one go at high speed and is fully compatible with all presentation files. Convert PPTs to AVI videos and view them on PC media players and on all AVI/HD-AVI-compatible devices without Microsoft PowerPoint. Practice and rehearse your presentation first, then record your commentary before making it into an AVI presentation. Mark the presentation as your own with your own trademark or logo added. Convert PowerPoint to AVI with all original slide features removed for maximized PPT to AVI conversion speed. Convert multiple PPT files to AVI videos simultaneously – save time and effort. Adjust the video quality, resolution, frame rate, slide playback interval and so on to create custom AVI video presentations. Convert PPT to AVI while preserving all original slide features in the source PPT file. Auto exit, shut down, hibernate, stand by PC, or do nothing at the end of the PPT to AVI conversion process. Can create AVI videos from all presentation file types (ppt, pptx, pptm, ppsx, pps, ppsm, potx, potm, pot) made with all versions of Microsoft PowerPoint. 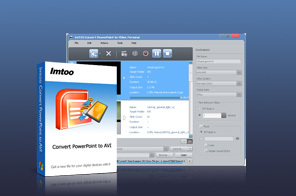 Preview the presentation with various features added prior to PowerPoint to AVI conversion. Multi-skin and multilingual interface available in English, German, French, Chinese, and Japanese.